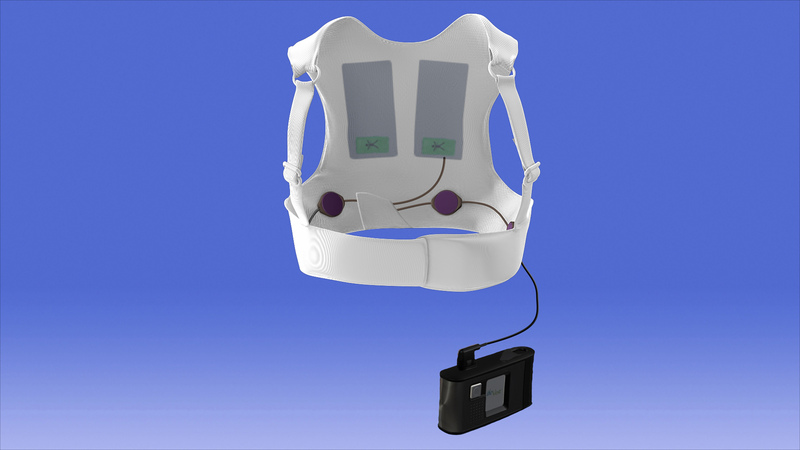 CHELMSFORD, Mass., March 10, 2018 /PRNewswire/ -- ZOLL® Medical Corporation, an Asahi Kasei Group Company that manufactures medical devices and related software solutions, announced today the results from the "Vest Prevention of Early Sudden Death Trial (VEST)." 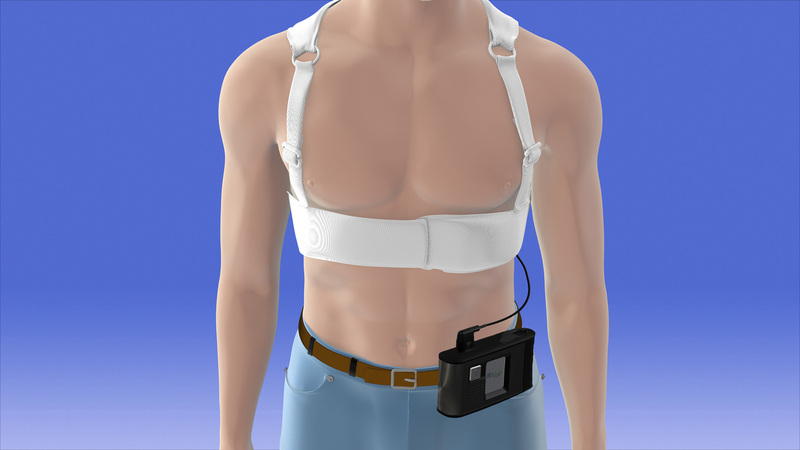 The study demonstrated that use of the LifeVest® wearable cardioverter defibrillator (WCD) reduced total mortality by 36 percent in the first 90 days following a heart attack for patients with a reduced heart function.1 Results were presented as a Late-Breaking Clinical Trial at the American College of Cardiology's 67th Annual Scientific Session in Orlando, Florida. "The VEST Trial demonstrated that the WCD was associated with a reduced total mortality in the 90 days following a heart attack," said Jeffrey E. Olgin, MD, FACC, Co-Principal Investigator, Professor and Chief of Cardiology at the University of California San Francisco Heart and Vascular Center. Dr. Olgin added, "While the VEST Trial did not meet the endpoint of sudden death mortality, the ability to determine the cause of death as sudden when unwitnessed is difficult and could result in misclassification. These meaningful total mortality results add large randomized controlled trial data to an already large body of clinical evidence in support of the 2017 AHA/ACC/HRS Guideline recommendations for WCD use in patients at risk of sudden cardiac death." 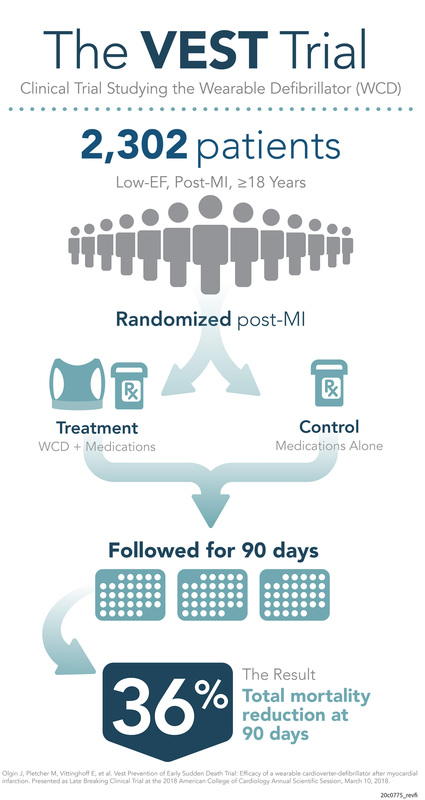 The VEST Trial studied use of the LifeVest WCD for patients who had recently suffered a heart attack (clinically known as a myocardial infarction or "MI") and had a reduced heart function (defined as a low-ejection fraction or "EF" of 35 percent or less). The trial enrolled 2,302 adult low-EF, post-MI patients, with or without revascularization (such as a stent placement or bypass procedure) across 108 trial sites in four countries. Patients were randomized to receive the LifeVest WCD and guideline directed medical therapy (GDMT) or GDMT alone for 90 days. 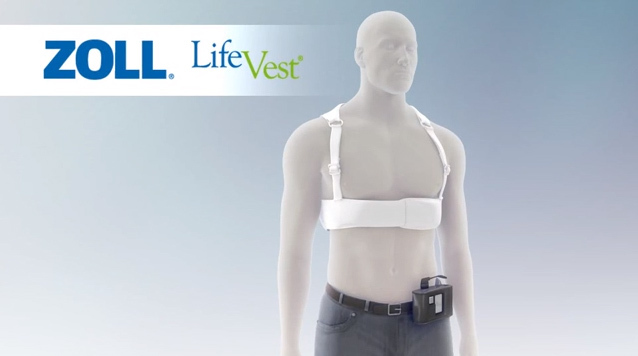 "The results of the VEST Trial show that, in addition to the current best practices in medicine which includes GDMT, use of the LifeVest WCD can further reduce mortality in patients with a low EF," said Kent Volosin, MD, FACC, FHRS, Vice President of Medical and Clinical Affairs for ZOLL LifeVest. Dr. Volosin added, "The totality of clinical evidence supporting use of the WCD, along with AHA/ACC/HRS Guideline recommendations, underscore the need to evaluate all patients for sudden cardiac death risk and discuss WCD therapy with patients and their families through a shared decision-making approach." The 2017 American Heart Association (AHA)/American College of Cardiology (ACC)/Heart Rhythm Society (HRS) Guideline for Management of Patients with Ventricular Arrhythmias and the Prevention of Sudden Cardiac Death include recommended use of the WCD for a wide range of patients, including those who have a low EF following a heart attack or new diagnosis of heart failure. For more information about the VEST results, visit www.zoll.com/VESTtrial. The LifeVest WCD continuously monitors the patient's heart and, if a life-threatening heart rhythm is detected, the device delivers a treatment shock to restore normal heart rhythm. 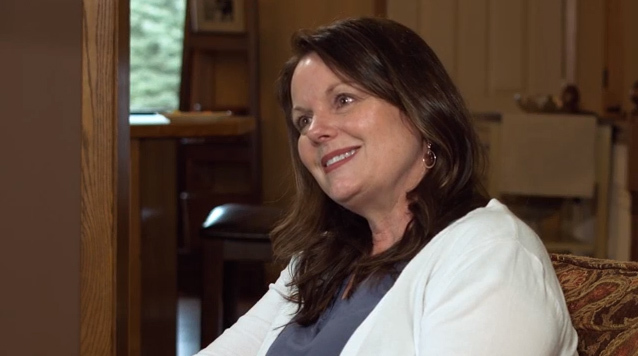 LifeVest gives physicians time to optimize medical therapy and assess a patient's long-term risk for sudden death. LifeVest allows patients to return to their common activities of daily living, while having the peace of mind they are protected from SCD. 1Olgin J, Pletcher M, Vittinghoff, E. et al. Vest Prevention of Early Sudden Death Trial: Efficacy of a Wearable Cardioverter-Defibrillator after Myocardial Infarction. Presented as Late Breaking Clinical Trial at the 2018 American College of Cardiology Annual Scientific Session, March 10, 2018. 2Halkin A et al. Prediction of mortality after primary percutaneous coronary intervention for acute myocardial infarction: CADILLAC risk score. J Am Coll Cardiol. 2005;45:1397–1405. 3Solomon SD et al. Sudden death in patients with myocardial infarction and left ventricular dysfunction, heart failure, or both. NEJM. 2005;352:2581–2588. 4Adabag AS et al. Sudden death after myocardial infarction. JAMA. 2008;300(17):2022–2029. 5Zishiri ET et al. Early risk of mortality after coronary artery revascularization in patients with left ventricular dysfunction and potential role of the wearable cardioverter defibrillator. Circ Arrhythm Electrophysiol. 2013;6:117–128. 6Weintraub W et al. Prediction of long-term mortality after percutaneous coronary intervention in older adults: Results from the National Cardiovascular Data Registry. Circulation. 2012;125:1501–1510. 7Packer M et al. The effect of carvedilol on morbidity and mortality in patients with chronic heart failure. NEJM. 1996;334(21):1349–1355.